The name Birdsville evokes quintessential images of Australia’s Outback – red sand dunes (in the nearby Simpson Desert National Park), vast and desolate plains, and the Birdsville Hotel. 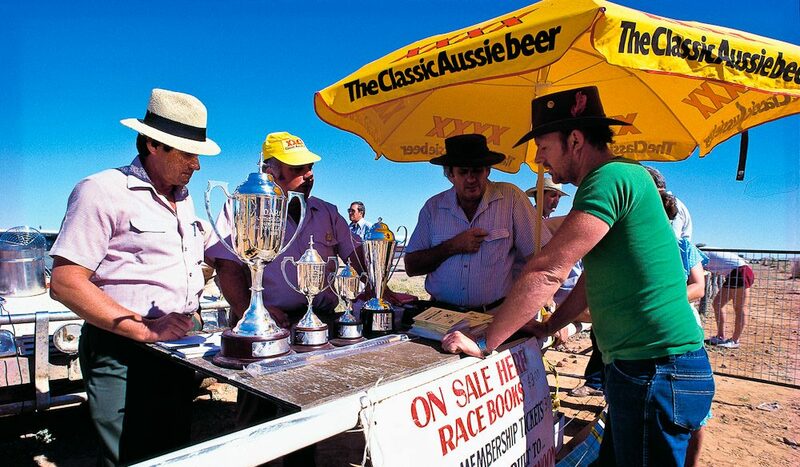 Oh, and once a year, the wild and wonderful Birdsville races. The reason you must front up to the Birdsville Races at least once in your life – quite apart from being a unique Australian sporting event – is that it’s likely to provide enough interesting yarns to last you the rest of your life. Birdsville is a tiny Outback town in far southwest Queensland – so far in fact that it’s nearly in South Australia. And nearly in the Northern Territory as well. It’s as far into the “Outback” as you can go before you actually start heading back in. Birdsville’s population of 120 swells to more than 5000 in the first week of September for the races, which are run on a claypan alongside the sand dunes three klicks out of town. Campers and caravans arrive from all over Australia (along with many international guests), usually up the famed Birdsville Track, the northern end of which terminates in Birdsville. A race for the Birdsville Cup was first run in 1882. In the early days, they had separate race programs for corn-fed and grass-fed horses. Also, the town itself was once called Diamantina Crossing, but was renamed Birdsville in honour of the diverse avian wildlife in the region. It’s not even unusual to find seagulls out there, seemingly lost in the middle of nowhere, drawn to the nearby salt lakes. All roads leading into Birdsville are unsealed. There are sealed roads up to 109 km west of Windorah, then 277 km of unsealed roads subject to flooding after heavy rain. The roads are open to conventional vehicles, but with caution. Please ensure that you have excess fuel, water, food, medical supplies and spare tyres in case of an emergency. The races take place every year in the first week of September. Generally, temperatures are most comfortable from June to August.